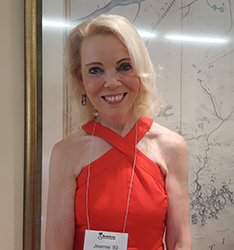 Jean “Jeannie” Brountas (Class of 1983) describes growing up in a Greek Orthodox family and the role that played in her transition to Bowdoin. She also discusses how she has applied her Bowdoin education to her career in business. She describes some of her jobs and other activities, including working for Residential Life and the Library and volunteering at a local middle school. She lists some of her favorite professors, including Professors William Watterson and William Whiteside. She recalls a prank by her freshman proctor that led to Brountas becoming more sociable, and tells of her later experience in the Chi Psi fraternity as a nondrinker. Brountas, Jean, "Interview with Jean Brountas (Class of 1983) by Ben Bousquet" (2018). Alumni Oral Histories. 2.